Although Britain had conducted many colonial military operations, the Crimean war was the first time that the British infantry had been pitted against European opposition since Waterloo 39 years earlier. Shortcomings in the supply system, which were to be one of the hallmarks of this campaign, caused suffering to the average British soldier right from the first day, yet they still performed admirably, with the battles of the Alma and Inkerman being the largest of their encounters. As always (at this time) Strelets have provided a set with all-unique poses. There are relatively few firing poses, with many more apparently advancing. Several are clearly engaged in hand-to-hand combat, which is very appropriate for this war, particularly battles like Inkerman. We liked the flag-bearer particularly, but as ideas we had no problem with any here, and the all-unique formula means there are some unusual and interesting choices here. At the start of the war the British Infantry had had a new uniform approved, but that failed to appear until the later part of the conflict, and all the major battles were fought in the rather old-fashioned uniform with which all these men are attired. This was broadly a coatee with fairly long tails and a shako, known as the 'Albert' shako, which tapered slightly towards the top. The shako was much disliked, and very many men chose to wear their forage cap, the Kilmarnock, which many of the figures in this set are sporting. Knapsacks had been left behind during the original invasion, and many took months to be reunited with their owners, so throughout 1854 and beyond some had them whilst others went without, and again this is reflected in these figures. Indeed some of these men have virtually no kit at all - not ammunition pouch nor even a bayonet, which seems to be unlikely for men sent into battle. The officers too have little or no kit (at this stage officers had the indignity of having to carry all their kit, just like the men), and the drummer seems to be missing the sword that he should have. The sculpting on these men is not good, with quite chunky and ill-defined detail and some poor realisation of poses. Several of the men have been sculpted holding their rifle at the same point with both hands, a very uncomfortable and unbalanced practice and very unlikely. In some areas limbs tend to be too flat, while some of the poses, particularly those involving clubbing or bayoneting, are quite unrealistic. Some proportions have also gone awry, with the small rear peak of the shako being made much too large, often larger than that at the front. On the plus side flash is very minimal or entirely absent. Any Crimean War range will require some of the long-suffering British infantry, but these figures, although reasonably accurate, are not a good representation. Note The final figure is of a soldier from the Streltsi of 17th century Russia. 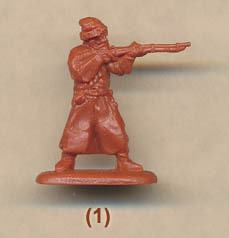 Though he is unrelated to the subject of this set, he forms part of a series of 'bonus' figures which when combined will create a set of this unit for the Great Northern War. See Streltsi Bonus Figures feature for details.